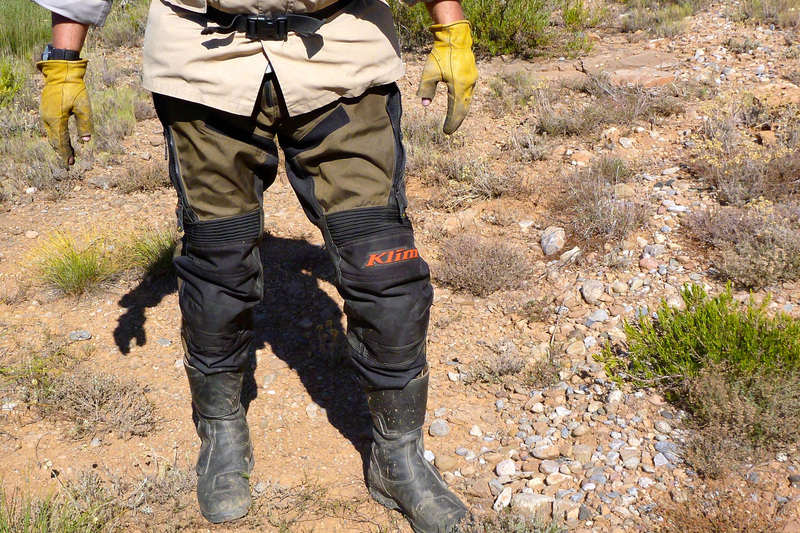 Tested: Klim Dakar 2016 ITB pants. 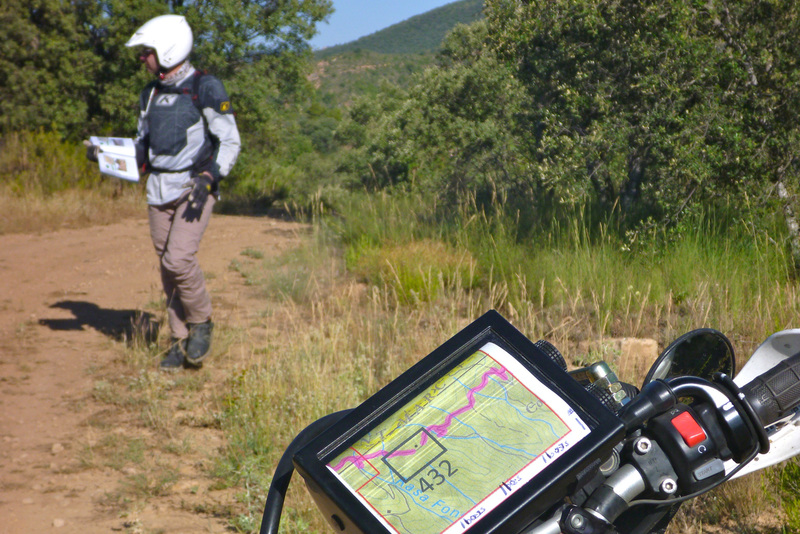 Where: Over 200 miles trail riding in the Pyrenees. Solid construction, good fit, look good in olive. Dry quickly on the move. Poor venting when seated in hot, slow conditions. 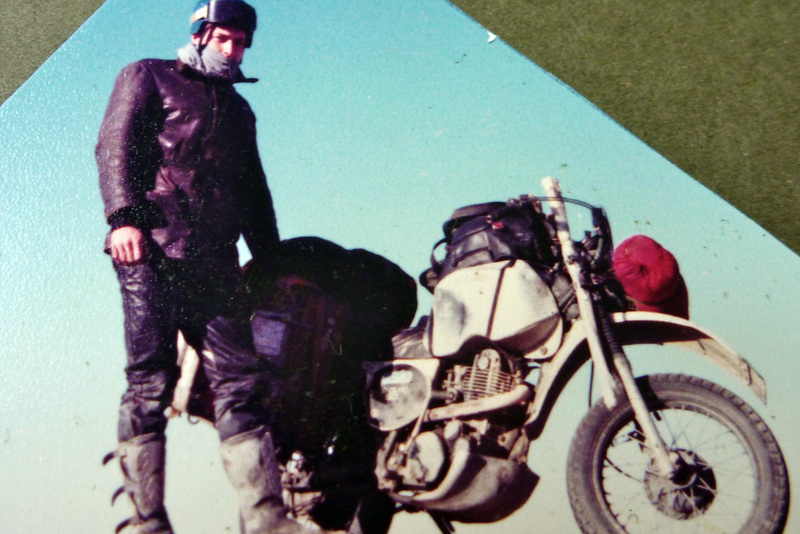 What are the best trousers to wear for overland travel? I can’t say I’ve ever got to the bottom of it. Breathable and vented Cordura overtrousers for the ATGATT brigade, kevlar reinforced jeans (right, sort of), leathers (below, 1982), MX pants? More than a jacket, it can be a tricky compromise between comfort, practicality, looks, plus rain and crash protection. Since the very start I’ve gone for leather trousers for biking travels as well as biking work. Watching Alvin Stardust and Suzi Quattro on TotP may have had something to do with it, but back then before Cordura, Gore-tex, D3O and kevlar, it just made sense unless you loved the smell of wax cotton in the morning. Leather is low to zero maintenance; lasts forever; look good in town and country, on or off a bike; good at sliding down the road or bashing into things too; warm enough in the cold; doesn’t show the dirt and is wipe clean – but quite hot in the heat. The main problem is at 2.5kg they’re so heavy they need braces to keep them up, and year by year it gets harder for me to swing the old leg over high-saddled trail bikes. It’s great to feel protected, but it would be nice to do so with less weight. And the older I get the more I’m disinclined to hurt myself on a bike. In the 21st century there must be something out there better than a skinned cow for riding the ranges. I have a pair of Aerostich GTX pants with full length side zips for easy putting on, but can’t bring myself to use them as anything other than rain overtrousers on a long cold ride for which they’re pretty bulky when not worn. I’ve never really been sold on membranes, which I’m beginning to realise, understandably err more towards waterproofness than breathability. 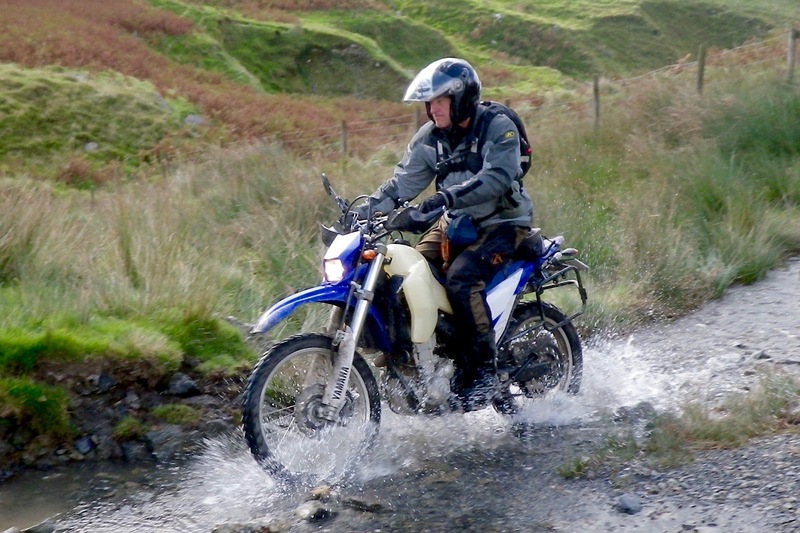 If they’re going to be clammy, I’d sooner wear something breathable and then pull on my classic Rukka for downpours. 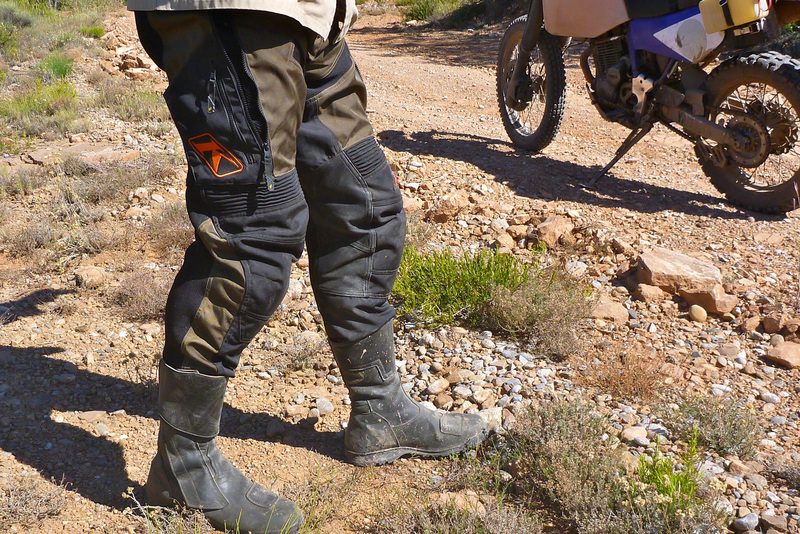 Klim make GTX trousers to go with their jackets too, but I asked Adventure Spec to try a pair of no membrane Klim 2016 Dakar In The Boot pants. I plan to wear them on this autumn’s Morocco tours instead of the leathers (by which time I’ll have more to say about them for travelling). For the moment I used them on one of Austin Vince’s two-day Pyrenean rides. Wearing thick layers of nylon wouldn’t be my first choice – I do prefer natural materials like cotton or leather, but these things just aren’t always as practical. 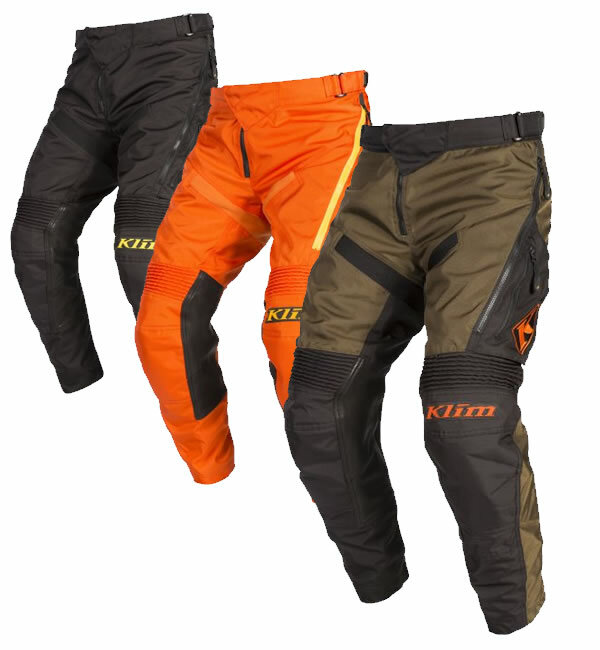 Your Klim Dakars are a heavy, thick pant made of lined Cordura and strategically positioned stretchy and ventilated panels. On top of the thighs are longitudinal vent zips with mesh behind, and alongside each of them a small patch pocket – the only ones you get. 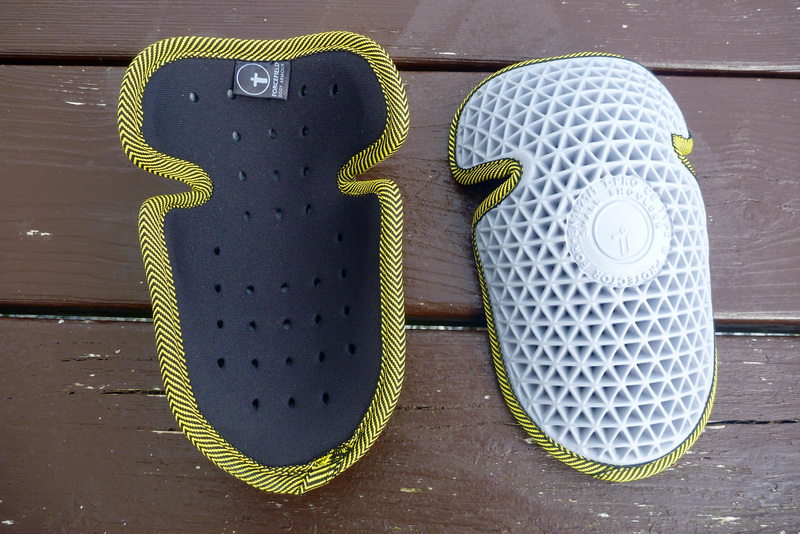 There are leather patches on the inside of the knees where you contact the bike, as well as sleeves inside for knee and hip armour. The hip sleeves could double as regular inside pockets. You get a velcro reverse belt, plus a zip fly and studs for a snug fit. The 38s fitted me just right. Anything but yet more dreary black is fine with me – but so is the extreme opposite of dazzling, high-octane colours. I find the olive and black combo just right. If you want to go shouty and frighten the horses there’s a set in burnt orange as well as plein noir. The whole lot weighs 1280g, exactly half my leathers plus 190g for a £20 pair of Forcefield shoulder pads which AS recommend for the knees over less durable D3O. As it’s not the semi-final of the Ezeberg I didn’t bother with hip armour. The best thing you can say about this sort of gear is that you forget it’s there. 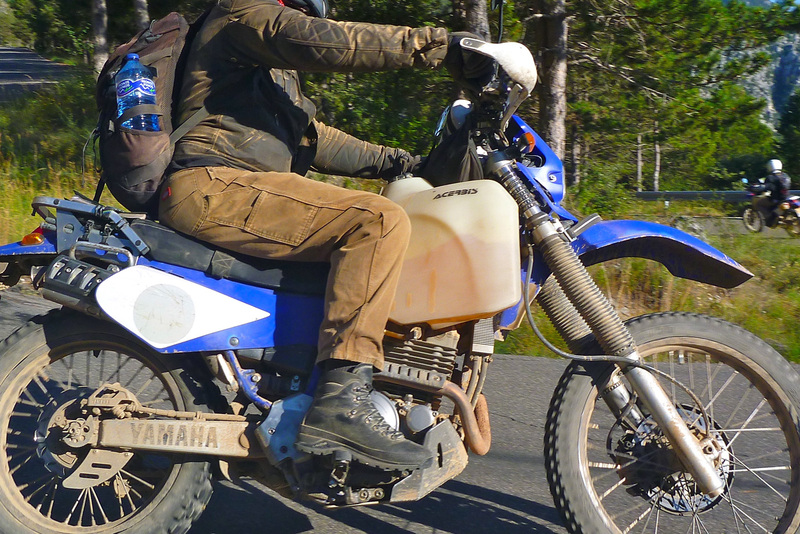 Beating up and down the valleys of the Pyrenees, getting on and off the TTR250 loaner to read checkpoints was no chore. I’d prefer a zip at the ankle to make a snugger fit ITB while still making them easy to take off. 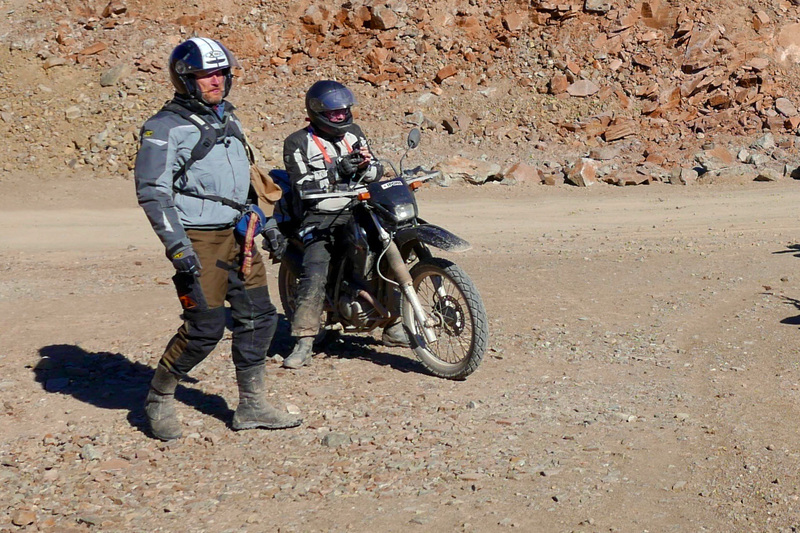 No so good was the fact that in the 35°C+ temps the thick pants got quite hot and sweaty, especially when waiting in the sun for the navigator to decode the map, but doubtless my leathers would have been cooking too. The vents should have cooled things off, but I found the foot-long knee-to-hip zip vent only really caught the breeze when I stood up like a proper ITB Dakar racer. When sat down the breeze just fluttered over the zip without purging any clammy air. Any chance I got to stand up, I did to get some flow on. What would really work when seated is some sort of lateral arched or sprung vent above the knee, acting a bit like those Ventz sleeve thingies (right). At one point mid-afternoon while letting the baking air-cooled TTRs cool down a bit, I just had to join in and drop my ITBs to air the heck off. Back at the ranch, 4 litres of sugar-and-salted water later, hygiene dictated laundering them before the next day’s ride. That day was at higher elevations as well as on faster tracks and backroads and the ITBs felt much less sweaty. Back home a proper wash in a machine saw the dye leak from the leather and take the edge of the orange branding on the pockets. 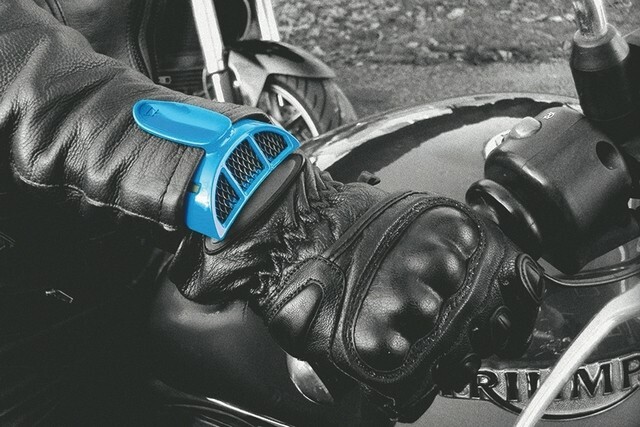 The rubbery Klim knee logo picks off too if you need a lower still profile. 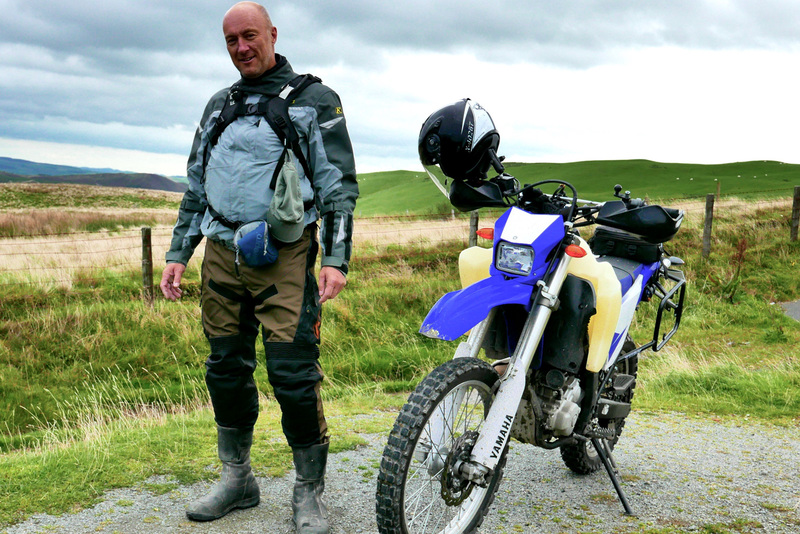 Since then I’ve used them trail biking in Wales – a lot cooler and with deep puddles so no probs getting hot, and when soaked from a big splash they dried quickly once on the move, so I never had the impression of wearing soaking trousers. When I got back on both days they were barely damp. The venting felt more effective too: closed up in the early morning chill and unzipped as the day warmed up and things got technical. 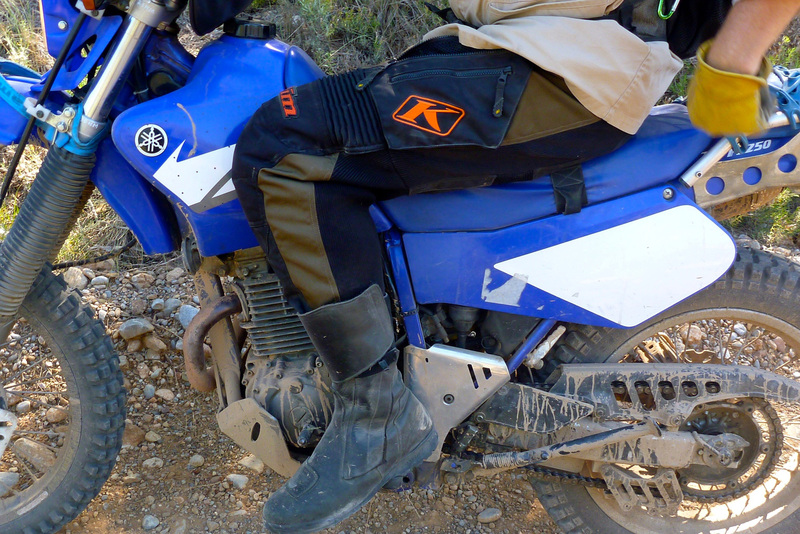 In Morocco (left) they worked fine – not too sweaty and the vents were in range, but missed some pockets. 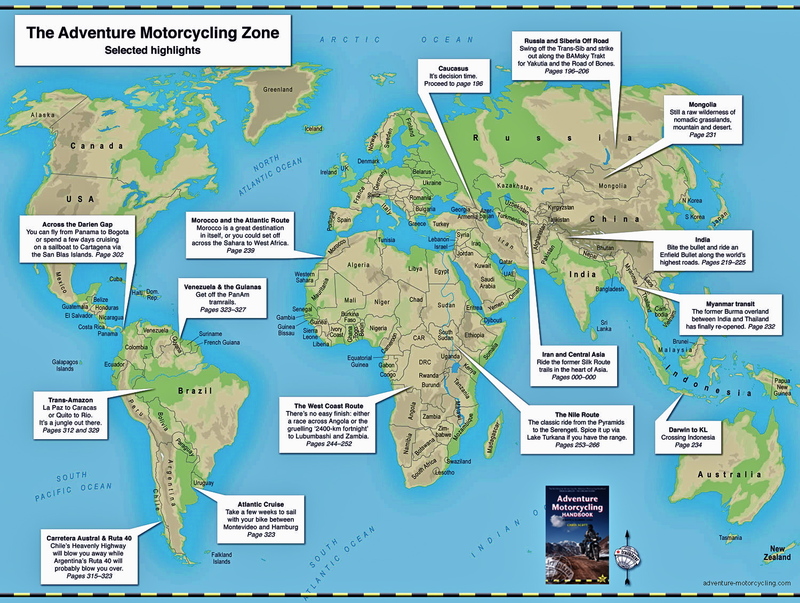 This entry was posted in Adventure Motorcycling Gear Reviews, Jackets & Trousers and tagged Forcefield armour pads, Klim Dakar ITB pants, leather trousers, trousers for overlanding. Bookmark the permalink.